Circular Staircase Design: Taking you a riser above the rest. Circular staircases offer a certain “wow” factor to residential and commercial spaces. This week, we feature one of our favorite premium circular staircases and walk you through the process of designing and constructing such a project. Built in the heart of Alpharetta, Georgia for a new construction luxury residence, this staircase system was selected as our June 2016 Project of the Month due to its beautiful aesthetic appeal. The perfect custom staircase fits flawlessly within a home’s unique architectural plans in terms of shape, layout, style and materials. Our creative team works collaboratively with builders, architects, designers and homeowners to discuss project inspiration and develop custom staircases that truly bring their visions to life. Offering a seamless transition from one level to the next, a circular staircase makes a grand statement within a home, and a round, modern stair was a natural fit for this Georgia residence. To further support the home’s modern style, marble, glass and stainless steel were selected to take the design to the next level. The glass staircase beautifully accents the home’s modern lines, offers open views, and complements the home’s strikingly gorgeous chandeliers. 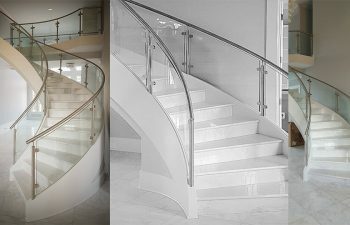 Through our efficient, professional process, this custom glass staircase was designed to modern perfection and built to withstand the test of time. We are proud of our team’s creativity and flexibility in designing and constructing unique staircases such as this modern Georgia staircase. We are excited to feature this stair as our June Project of the Month and look forward to sharing additional unique projects in coming months. Visit our circular staircase product gallery for additional details and pictures on our exquisite projects. From inspiration to installation our team is committed to designing and building the highest quality custom staircases. Our reputation speaks for itself and client satisfaction is our highest priority. Contact us today to discuss your next curved stairs project.